Oh my god. A future classic of the "Plunged into a magical and confusing world and given A Quest" genre. A Wizard of Oz without all the ex machina. Alice in Wonderland without the creepy context. A modern great. I bloody loved it. Fidge, an intelligent and practical 10 year old with problems expressing her feelings, has accidentally caused an accident that has resulted in her 4 year old sister, Minnie ending up in the hospital with a broken leg. She was mad at Minnie, the irritating little sister who always gets her way, because she makes her read the The Land of Wimbley Woos book every night, she is always dropping her toys and generally being scatty, and the combined faffing powers of their mum and Minnie has meant that the sports shop was shut and now Fidge can't get her flippers for the holiday tomorrow. Fidge is not handling her Father's death, 2 years ago, very well. Her clinging onto the ideas of order and organisation are her ways of keeping him close. Riddled with guilt and anger, Fidge is bundled off to her useless, world-phobic cousin's house, a neurotic, translucent specimen named Graham that is so afraid of his own shadow and a sudden (unlikey) violent death that he spends most of his life in one room lying down and being stressed. In her emotional state and with a sudden flare of cruelty, Fidge hurls Minnine's toys (a purple elephant, Wed Wabbit, a fake phone) and Graham's Transitional Object, a plastic carrot down the cellar stairs, along with a Pop Up edition of the Wimbly Woos. He must go and get them. This assortment of objects, combined with some electrical storm magic, is about to get weird in the most gloriously anarchic way. Fidge wakes in a strange, colourful world- super green grass, super blue sky, loads of different coloured bin-shaped characters that seem to have very specific skills and talk in rhyming couplets. She recognises the world. But it cannot possibly be so. The world of the Wimbly Woos has been turned upside down. The colours, with their specific skills and attributes have been divided. Most are in hiding. The blues, the strong ones, have become a ruthless army in the service of an evil dictator. Sweets have been stockpiled. The King has been deposed, tyranny reigns. Also, everybody speaks in rhyming couplets, no exceptions. After linking up with the blubbering, terrified Graham discovered danging from a tree, a random, huggy Pink, the cool, rational Dr Carrot (human sized plastic carrot) and life coach Ellie (giant purple elephant with tutu), Fidge must set about getting to the bottom of what has happened in the Land of the Wimbly Woos. First stop is the Purples, who know the history of the land. This kicks off with a prophecy, some rhyming clues and an expedition the length and breadth of the Land of the Wimbly Woos, an expedition that will teach Fidge and Graham some life changing lessons about bravery, difference and fascism. I LOVED Ella and Dr Carrot, the adult substitutes. Ella is a purple elephant, performance artist, life coach and free spirit. Dr Carrot is stiff and practical, the example, the ballast that keeps the group grounded. Together they were such a brilliant team and so incredibly funny. I love a band of misfits, and these really were a top quality selection of oddballs and kooks, the very best kind of protagonists and helpers. Though Minnie is absent for most of the story, she dominates it with her imagination. Everything about the Wimbly Woo's world is directly from her imagination. The punishments, the riddles- all of Minnie's construction. It is so gloriously believable as a a world devised and created by the illogical mind of a four year old. I loved the book's message- that differences are to be celebrated and embraced and that a team can be more than the sum of its parts. I really liked Graham's evolution as a character- he learned to control his fears, to take risks, to be present rather than afraid. He was much braver and kinder as a result of Fidge and Dr Carrot's influence. Fidge too needed to learn to open up a bit more, that she cannot control everything, that too much control is actually a very damaging thing (just look at Wed Wabbit). It's a tall order to write a book with a 10 year old protagonist, set in the mind of a 4 year old and create a story that is so universally appealing. Wed Wabbit is so skillfully crafted, so identifiable, so positive and so enjoyable as a reading experience. It's a moving story about sisters and grief and emotions, about working together and being stronger for your collective differences. 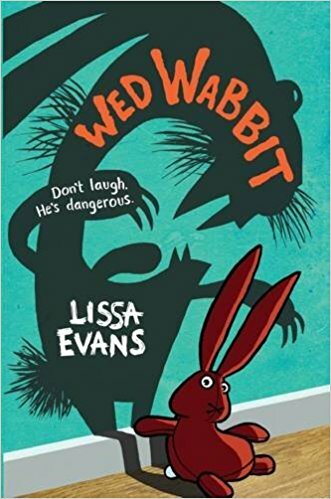 It's instantly recognisable as a Quest in Magical World narrative, but this particular story is reborn with brilliantly clever use of language (rhyme, speech impediments, the smiley smiley language of picture books), some very modern characters and an intelligent brand of humour that is pretty relentless. Kids will still be reading this in 50 years, I'd bet anything on that. An absolute belter, one of the best books I've read in a long time.